Ala Moana Bowls was glassy with 1-3’ surf this past weekend for the first leg of the 3 part series of the Hawaii Surfing Championship annual event sponsored by Hawaii’s own noRep Boardshorts. The winds were absent and that made for some high performance surfing in some extremely warm weather, luckily the ocean is our playground. The longboard division had some amazing surfing go down. One of the highlights of the longboard division was Isaac Kaneshiro from Ewa Beach getting his board skegged in a freesurf before his heat and having a ripped out fin box and about 10” of foam showing. Then surfing his early round heat using only the back fin of his thruster setup & still taking first place to move on to the final. 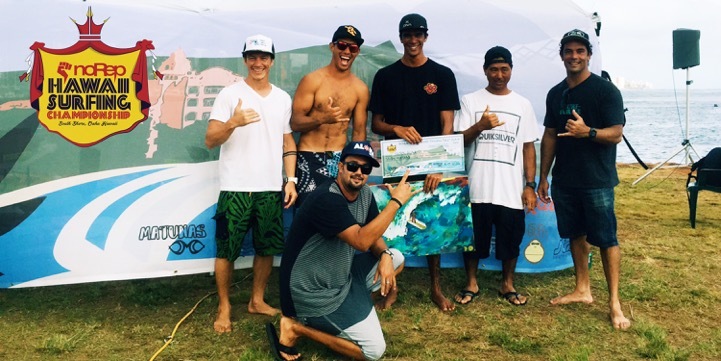 Kaneshiro would end up getting 4th & $150 in the final with Kai Sallas in 3rd taking home $200, Makamae Desoto in 2nd for $350, and taking the win was Nelson Ahina who laid it down to pocket $700 & the first place custom painting by Duran Caps Doll. The shortboard division had some intense heats too. With plenty of airs and power hacks laid down. 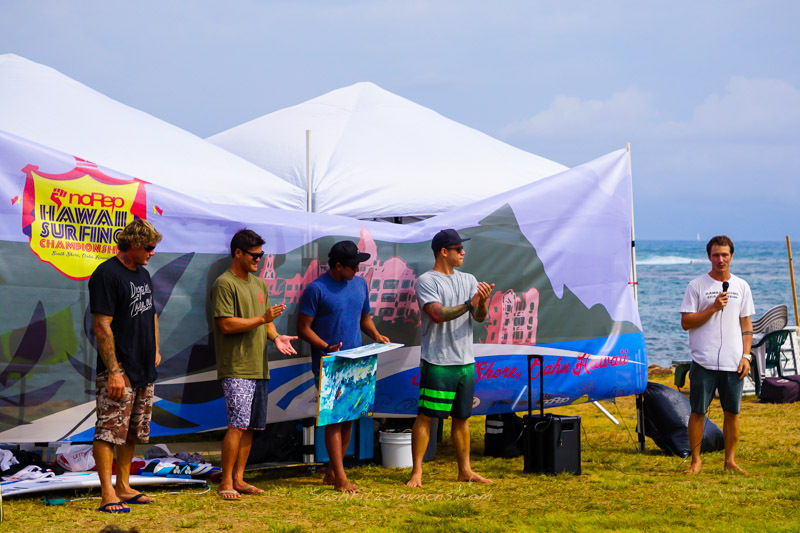 Kylen Yamakawa and Josh Moniz above the lip maneuvers would help earn them the top two spots with Moniz getting the $1500 oversized check and the Duran Caps Dolls artwork for taking 1st. 3rd place was Kaimana Henry and 4th was Kekoa Cazimero. A big mahalo goes out to the event sponsors: noRep Boardshorts, Surf Garage, Kai Sallas Surf School, Nalu Health Bar & Café, Sun Bum, Matunas, SNN, 569-SURF & Surfing the Nations. We couldn’t have done it without their support.